TKR Piping is an integrated, seamless pipe renovation system for renewing cast iron, PVC and concrete drains from the floor drain to street sewerage. The system consists in casting a new drainpipe within the old pipe. 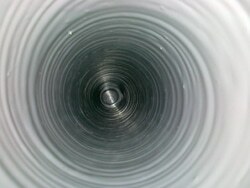 Wall thickness of the new drainpipe varies from 2 to 5 mm depending on application. The casting technology and TKR Piping compound used in the cast represent tested, safe and environmentally friendly technology. A new drainpipe cast with the product is damp-proof, corrosion resistant, wear-resistant and non-corrosive. Thanks to high breaking stretch it also stands shocks and bending. The new drainpipe becomes elastic and antistatic. TKR Piping compound is odourless both during installation and as a finished product. Getting acquainted with the site and the drawings. Protecting the floors and walls, dismounting water fittings, enlarging the cleanout of the floor drain. The drains are washed with water, dried and videographed The drains are cleaned mechanically, vacuumed and videographed. The drains are cast and the floor drains are waterproofed. The drains are dried, videographed and checked. The water fittings are remounted. Final cleaning.